Bangladesh Navy Commissioned Officer Job Circular 2018. 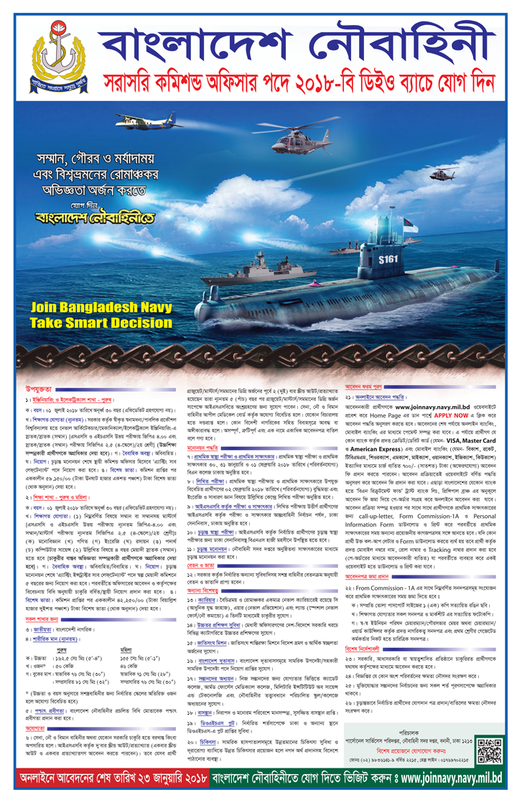 Bangladesh Navy Commissioned Officer Job Result 2018. www.joinnavy.mil.bd Written Viva Exam Result 2018 published on some Newspaper, Navy official website and our website ReadingBD.com. Download Bangladesh Navy Circular to apply for the post Direct Commissioned Officer 2018. Bangladesh Navy result for Commissioned Officer will available in our website. Good news is, recently the BD Navy wanting New Job holder against empty vacancy. However, if you interested to do government job, we predict Bangladesh navy Jobs 2018 is sweet one. Thus interested candidate checkout all of essential data like apply procedure etc. The Circular published for Direct Commissioned Officer 2018. Bangladesh Navy has declared the circular for Direct Commissioned Officer Post. Bangladesh Navy as Direct Commissioned Officer 2018 is for Bangladesh Navy as Officer Cadet in 2018 B-DEO Batch. At present in Bangladesh government jobs is extremely qualified and fashionable profession for peoples. Because, we all know that any permanent government profession could a nice chance for anyone. Thus you’ll able to maintain all of procedure with properly and steel oneself against ensuing step as writing examination. Interested people join Bangladesh Navy as Officer Cadet. Bangladesh Navy as Direct Commissioned officer 2018. The circular is online based. Candidates have to apply online application for Bangladesh Navy as Direct Commissioned Officer 2018 B-DEO Batch. Applicant must be Graduate/ Post Graduate/ Masters Degree in Engineering/ Mathematics /Physics/ Chemistry/Computer Science/ MBBS Degree/ Law or equivalent in related discipline from any recognized institute (College/ University). The Recruitment of Bangladesh Navy as Direct Commissioned Officer 2018 will hold Written Test, Medical Test, Physical Test and Viva or Interview. Candidates must attend all tests. Written Test Subjects: English, General Knowledge and IQ. Circulation of add at various papers and media. There are some steps of Bangladesh Navy as Direct Commissioned Officer 2018. Candidates must attend the all steps and must be passing in all, and then they will get the chance to join here. The steps are Primary or Written Test, Medical and Interview. Online for Trust Bank Mobile Money (TBMM) account holder, offline for non account holders. Suitable Candidates are requested to apply through online or manually. Go to message option of your mobile and send sms in the following system. You have to have minimum balance of BDT. 720 (Five Hundred and Twenty Taka) in your account. TrustMM<space>BNRF<space>O<space>PIN<space>Candidate’s mobile number<send to> 03590016201(Here O is to mean officer). Manual application form collection address are given in the circular. Application fees tk. 700. If anybody wants to apply online previously he should send application fees then apply. Details circular, information, instruction and requirements documents are given in the circular. After all procedure they will declare the exam result. So keep on your eyes on our website to get all update information about Bangladesh Navy Commissioned Officer Job Circular 2018.